Standoff in Catalonia; Fed tease; Mueller moves? 1. Standoff in Catalonia: Spain's benchmark stock index bucked the broader trend in Europe on Monday, gaining 1.6% after Madrid moved to quash a separatist movement in the wealthy region of Catalonia. Spanish Prime Minister Mariano Rajoy sacked Catalonia's president and dissolved its parliament on Friday after lawmakers in the autonomous region voted to declare independence. On Sunday, hundreds of thousands of anti-independence protesters rallied in the regional capital of Barcelona. What happens next is unclear, but more volatility appears likely. 2. Mueller moves? Robert Mueller, who was appointed in May to lead the investigation into Russian meddling in the 2016 U.S. presidential election, may deliver a political bombshell on Monday. Sources briefed on the matter told CNN that a federal grand jury in Washington has approved the first charges in the investigation led by the former FBI director. Plans were prepared for anyone charged to be taken into custody as soon as Monday, the sources said. President Trump and his team deny any wrongdoing. 3. Fed tease: Trump has tweeted that he is preparing to name his pick to lead the U.S. Federal Reserve. "People are anxiously awaiting my decision as to who the next head of the Fed will be," he said. There has been speculation for weeks about whether Trump would renominate current Fed chair Janet Yellen to another four-year term. Two sources told CNN on Saturday that the president is likely to instead name Jerome Powell. Powell, a Republican, has been a governor on the Fed's board since 2012 and was assigned to lead the bank's Wall Street oversight committee in April. Trump could still change his mind, the sources said. 4. 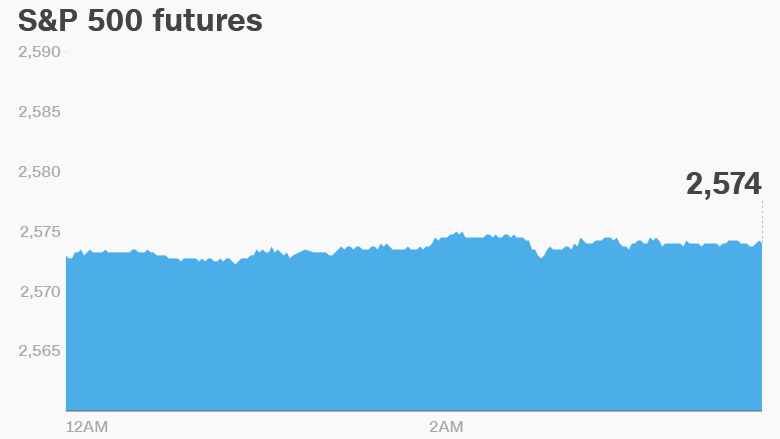 Global market overview: U.S. stock futures were lower. European markets, with the notable exception of Spain's Ibex 35, were down in early trading. 5. Friday market recap: The Dow Jones industrial average gained 0.2% on Friday, while the S&P 500 added 0.8%. The Nasdaq jumped 2.2% on a banner day for tech earnings. 6. Earnings and economics: Data on U.S. personal income and spending for the month of September will be published at 8:30 a.m. ET. Mining giant Glencore had some positive news for investors as it recovers from a global commodities price crash. The company said it expects to earn $2.6 billion to $2.8 billion this year, up from its previous estimate of $2.4 billion to $2.7 billion. Mondelez and Unisys (UIS) will publish quarterly earnings after the closing bell in New York.